One in four women will experience domestic violence during their life time. This fact is true in faith communities as well as in the wider community. Too often women experiencing domestic violence are not heard when they speak up about the abuse to members of their churches. These women also may encounter criticism and judgment from church members. As a result, abused women seeking support from their faith communities shut down and become more isolated. Churches must strive to be a source of comfort and support for those who experience domestic violence. Doreen, a Licensed Professional Counselor, obtained her Bachelor’s degree in Community Ministries from Geneva College and her Master’s degree in Community Counseling from Indiana University of Pennsylvania. Doreen is the founder of Enduring Hope Christ Centered Counseling, a non-profit ministry for women who are spiritually, emotionally and/or physically at risk. Doreen also is a discipleship leader and teacher providing outreach to the local community. She also is a FOCUS Ministries trainer for Faith Based Domestic Violence Certificate Training and workshops. She has been counseling women suffering from domestic violence and relationship issues for over fifteen years. In addition, she provides education on domestic violence and abuse as well as training tools for individuals and support groups. Doreen uses a biblical counseling approach and is certified in Cognitive Behavioral Therapy, Addiction and Recovery, and Genesis Process. Doreen has specific training in trauma resolution and post-traumatic stress disorder. In addition to counseling victims of domestic violence and sexual abuse, she provides counseling for depression, anxiety, and other mental health challenges as well as crisis counseling. 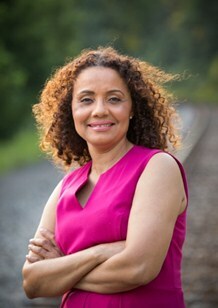 Angela represents the 25th District of Prince George’s County. She serves on the Health Government and Operations Committee and is Vice Chair of the Bi-County Subcommittee of the Prince George’s County House Delegation. She is an active member of the Legislative Black Caucus and the Women’s Caucus and serves on the Children’s Environmental Health and Protection Advisory Council. In 2001, Angela graduated from Hampton University. She studied law at Yeshiva University and subsequently prosecuted cases of child abuse and neglect. Angela has worked as a policy advisor for Prince George’s County Department of the Environment and for Council Member Derrick Leon Davis. She lives in Upper Marlboro with her parents and her five children. Henrietta Hadley travels across the country speaking on domestic violence and performing a one-woman play entitled Promises. Henrietta has used Promises as a tool to help families identify the red flags of a violence in a partnership or marriage and how to escape a potentially deadly relationship. Her play has assisted family and community members understand the cycle of Domestic Violence and how to support individuals suffering silence regain their life. She also has co-authored a book entitled “Project We are Free” with seven survivors of domestic abuse. Project We Are Free” is presented by Speak Up Speak Out Enterprises creating a culture for women around the world to use their voices to liberate themselves and others. Rose is a graduate of The Catholic University of America with a Bachelor of Science in Nursing and has spent most of her 30-year nursing career as an emergency room (ER) nurse. She treated many victims of domestic violence in the ER and noticed that even among trained professionals, a woman who experiences domestic violence frequently is misunderstood. As a survivor of domestic abuse, she organized and facilitated a Christian-based support group for women experiencing or who have a history of domestic violence. She is author of A Path to Hope: Restoring the Spirit of the Abused Christian Woman, which describes the abused Christian woman’s journey as she finds answers to troubling spiritual questions, seeks help from the community, and achieves freedom and healing.